The Wilhelm Raceworks Stoptech big brake kit for the 90-99 Toyota MR2. 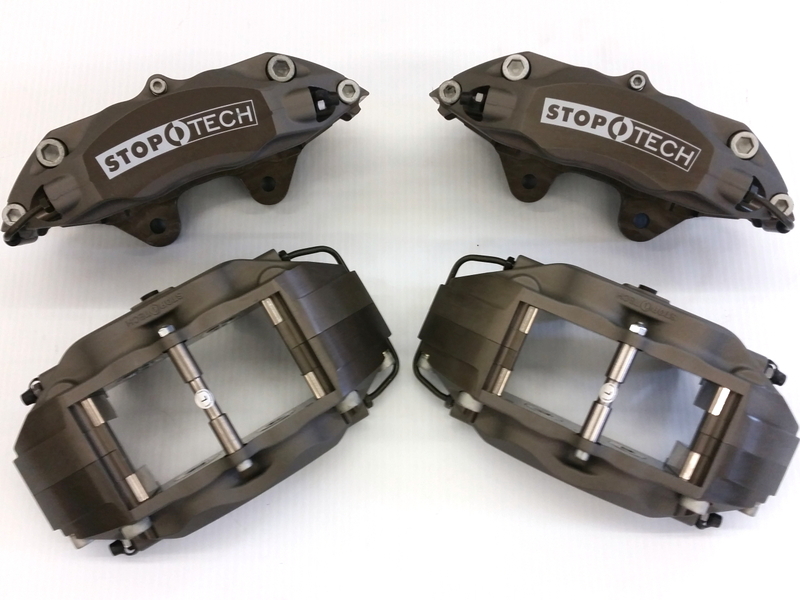 Based on my Wilwood Heavy Duty kit, this kits adds Stoptech's ST-43 Race caliper for industry leading caliper stiffness, plus staggered pistons to combat pad taper wear. Additionally, the piston sizes are specifically chosen to optimize brake bias for the MKII MR2. You won't find these calipers anywhere else! Stoptech Sport brake pads, suitable for street and moderate track use. Please specify proportioning valve type (Turbo, NA, or aftermarket adjustable) when ordering. 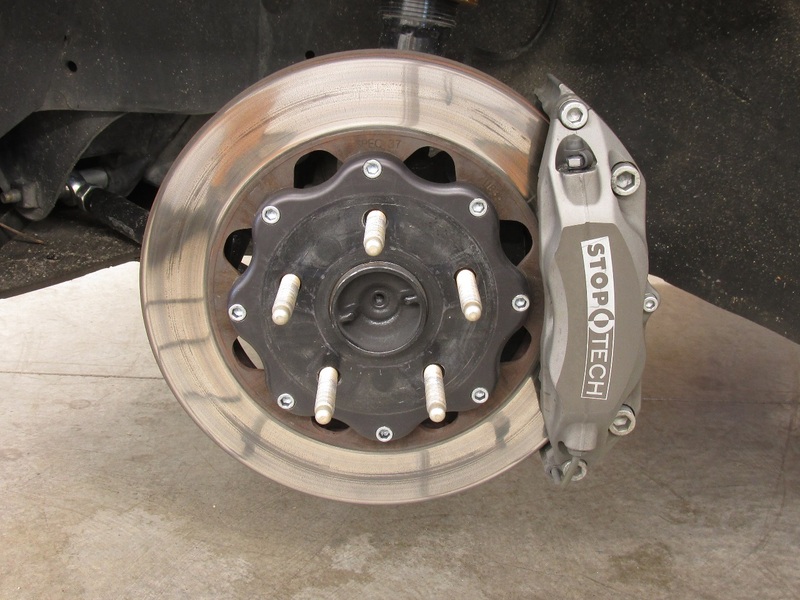 Note: The Stoptech calipers in this kit are made to order and shipping may be delayed by several weeks as a result. I strongly recommend purchasing safety wire and a pair of safety wire pliers to wire the rotor bolts. You really don't want these coming loose! The kit that I used is for sale on Amazon.com. 25' of safety wire is enough to do four rotors with some extra for mistakes. International shipping (other than to Canada) is likely to be quite expensive on this kit. For my international customers I recommend finding a local Wilwood dealer for the rotors and parking calipers, and possibly a Stoptech dealer for the calipers. Please contact me to discuss, I will do my best to facilitate this process. If you have a favorite brand of brake pads you wish to use, the pads can be eliminated from the kit, or an alternate pad can be substituted. Please contact me to submit a custom order if you would like pads other than the standard Stoptech Sport pad. The slotted GT versions of the standard HD rotors are also available as a custom order. Note: The standard color of the main calipers is a dark gray as shown above. The parking calipers are available in black, red or silver (black is standard, please let me know if you want one of the other colors). The Stoptech calipers are available in red, yellow, blue, black, and silver as a special order for an extra $70 per caliper. This kit can use virtually any 12.19" rotor with an 8x7.00" bolt pattern, 1.25" thickness for the front and .81" thickness for the rear. There are numerous options from various manufacturers including Wilwood, Afco, Colman Racing, and many others. They are available with straight or curved vanes, and slotted, cross drilled, or both. The Wilwood options are shown in the chart below. There are many others on the market as well. Be sure to purchase one right and one left if buying curved vane rotors! The Stoptech calipers in this kit are custom made to my specifications to optimize brake bias for the MKII MR2. Two front caliper options are available to suite either the stock turbo proportioning valve, or the NA or an aftermarket adjustable valve. However, if you have a factory turbo I highly recommend either finding an NA proportioning valve for it, or installing an adjustable valve. The overall resulting bias is better across a much wider range of deceleration rates. The parking caliper used with the kit is the Wilwood MC4. One of each LH/RH is required. The part numbers above are the black powdercoated version. Red and silver are also available. 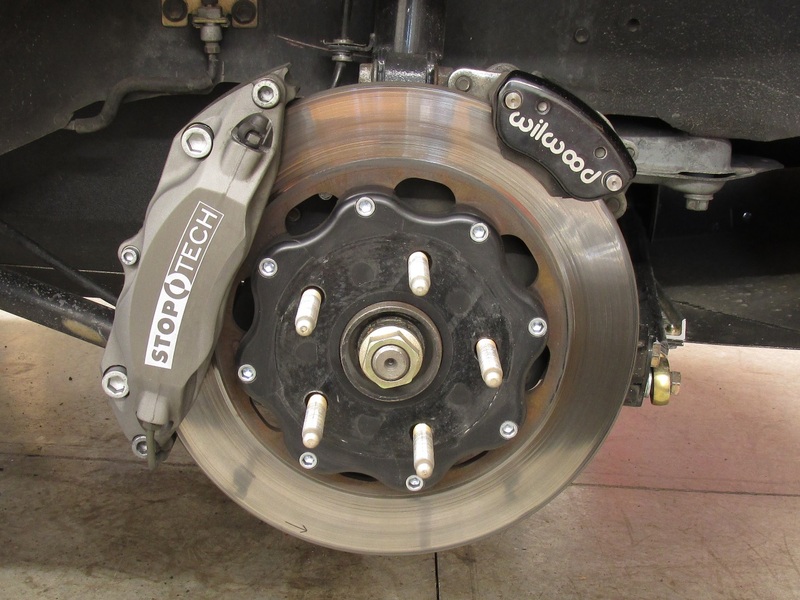 The Stoptech ST43 caliper uses the same pad shape as the Wilwood Forged Superlite used in my Wilwood Heavy Duty kit. Many companies make pads in this shape in many different compounds, including but not limited to: Stoptech, Wilwood, Porterfield, Performance Friction, Hawk, Raybestos, etc. The Wilhelm Raceworks hats and main caliper brackets in this kit are machined from 6061-T6 aluminum, and black anodized. All are designed around the brake torque required for 1.4g deceleration, and with a factor of safety of 2x on the 500 million cycle fatigue strength of 6061-T6 aluminum. 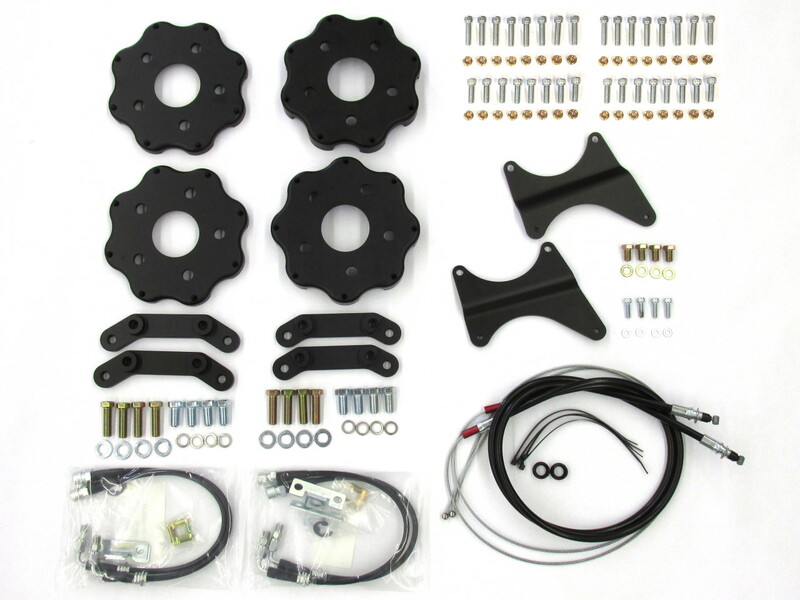 The parking brake system in this kit is capable of achieving deceleration rates of ~.3g. More than enough to pass the emergency brake function tests that I am aware of. However, it is ultimately designed and intended to be a parking brake, or for that once-in-a-lifetime emergency situation. If you are drifting or doing hand-brake turns, you may find it to be insufficient. Assuming adequate spoke to caliper clearance, most 16" wheels should fit over the front brakes without issue. The parking caliper in the rear might cause an issue with some 16" wheels. Use the template below to check fit on your wheels before ordering.